I agree with the Irish left mainly on civil liberties (for example, the blasphemy law). I disagree with them primarily on the economy, crime, and foreign policy. Some of the following have noble records in fighting for sexual and religious freedom in Ireland, the rights of gays and atheists, separation of church and state, opposition to censorship, and so on. But that does not mean that their foreign policy or economic ideas make any sense. For reasons I discuss elsewhere, the Irish left is far more likely than the Irish right to make embarrassing statements supporting foreign non-democrats (such as Cuba, Nicaragua, Palestine, Libya, Vietnam and the Soviet Union). Such statements need to be remembered. Proinsias De Rossa was leader of the extremist Workers Party. He was later in the Labour Party. De Rossa attended a Soviet propaganda event in Dublin, reported in Irish Times, January 11, 1983. He then however protested US Vice-President George Bush's visit to Ireland, May 18, 1983. He complained, October 25, 1983, about the use of Shannon Airport by US military on their way to and from West Germany. He protested US President Ronald Reagan's visit to Ireland in 1984. He gushed praise over Soviet dictator Gorbachev's visit to Ireland, April 3, 1989, despite the fact that Bush and Reagan were elected and Gorbachev wasn't. De Rossa defends Nicaragua in the Dail, 26 Apr 1983: "One of the most serious charges made by the USA against the Sandinista Government was that of persecution against the Miskito Indians. ... They continue to repeat this charge despite the fact that it has been denied by independent sources". 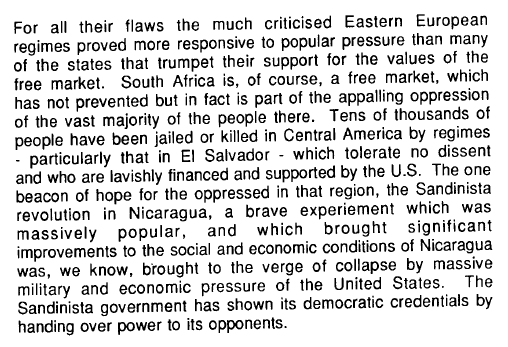 De Rossa, November 10, 1984, defends Nicaragua. Dail, 6 December, 1984. A motion is proposed to call on the Soviet Union to grant Jews religious freedom and allow them to emigrate. What kind of lunatic could speak against such a motion? De Rossa could: "the proposers of the motion did not approach Deputy Mac Giolla or myself to see if we would be prepared to support this motion. ... we recognise that there is a problem of alienation of Jews in the Soviet Union. However, we do not go along with the terms of the motion as put forward because it is an over-statement and the case made to support it has not been proved. There are obviously two sides to every story and no case has been made for the defence." Note the patronising "alienation" of Jews, not "oppression" of Jews. He claims there is something wrong with being anti-Soviet! "the case that is made concerning the USSR is in many instances tinged with a high level of anti-Sovietism. I heard Deputy Taylor deny that he is in any way anti-Soviet, and I accept and welcome that." Like a credulous child, he believes Soviet propaganda: "The case has been made that Jews in the Soviet Union are completely oppressed, are denied any rights and denied the facilities to practise their religion or to learn the Hebrew language. I have here some figures from an official Soviet source which to some extent at least refutes the assertion that all Jews in the Soviet Union are oppressed. I will go through those figures very quickly. ... Religion in the Soviet Union is a private matter, ... we have to accept there are two sides to every story. I am simply putting forward my views on this matter and I am indicating that I do not believe there is total oppression of Jews in the Soviet Union. I should like to quote a letter which appeared in the English language Soviet Weekly". He sneers at political prisoners: "People have listed people who are persecuted in the Soviet Union. I have here a report to the Council of Europe and it lists a number of people who were imprisoned allegedly for trying to teach the Hebrew language or for pursuing cultural affairs. It always amazes me that all these people are very well educated." Israeli wall creating Palestinian ghettoes (also here), Proinsias De Rossa, March 9, 2004. De Rossa compares the Israeli security wall to the Nazi ghettos: "Looking at the watchtowers, guns and barbed wire, I thought of the Warsaw Ghetto. Growing up just after the second World War, I could not understand how the world stood by (*) while six million Jews were gassed, burned and buried alive. I learnt the answer in Qalquilya. First, you dehumanise your victims, than you criminalise them en masse, and then you imprison them en masse. Finally, you can kill them while the world watches." De Rossa calls Gaza a "prison camp" (also here), Nov 2006. "The occupants of this camp are being systematically starved." "At the same time they are being massacred." (*) The world did not "stand by", Mr. De Rossa. Britain and America - the two countries you have spent your entire career attacking - fought to stop it, and sacrificed 900,000 lives to end it. They were joined by Australia, Canada, New Zealand and many others. Ireland stood by, it is true - to its eternal shame. Ireland stood by because of all the appalling anti-British, anti-American and "anti-war" people who, unfortunately, so often dominate discourse in this country. People like the modern Irish left, in fact. Sinn Fein - your first political party - not only stood by, they actually supported the Nazis. Were you not aware of this? It was no secret, then or since. If you "could not understand" growing up in the 1950s how the world stood by during the Holocaust, if you thought it was such a big issue, then how come the first political party you joined was the only one in Ireland that had supported the Nazis? Yes I know you were never pro-Nazi. Yes I know Sinn Fein were no longer pro-Nazi when you joined them (because Germany had lost). Yes I know you have renounced Sinn Fein long ago anyway, and gone through a long political journey since. I am glad you have. But you've still a long way to go before you understand who are the kind of people who will "stand by" in the face of fascist, communist or Islamist tyranny, and who are the kind of people who will go out there and fight it. If you really wonder how people could have stood by in WW2, then you should become (as I have become) a fan of Britain and America, and a bit of a sceptic of countries like Ireland. Soviet Archives (also here), by the brave Russian dissident Vladimir Bukovsky, contains many documents secretly scanned by Bukovsky from the former Soviet Union. Item 0640. Alleged letter from the Workers Party of Ireland to the Soviets. 15 Sept 1986. The above is the letter at the centre of the De Rossa Libel Case in which De Rossa won £300,000 plus costs. See libel case details. He sued about an article by Eamon Dunphy in the Sunday Independent on December 13th, 1992. De Rossa denied that the signature on the above letter was his. In other words, his position is the letter is a fake. Bukovsky replies to this allegation that his archive contains a fake. There remains to this day no explanation for how a fake could have ended up in the Moscow archives. It should be noted that Dunphy's article contains many allegations beyond just publishing the Soviet letter. The Sunday Independent may have lost the case, but they did achieve something. The trial was a great public service in bringing out embarrassing information about the Workers Party. Irish Times articles, Feb-Mar 1997. March 1, 1997: De Rossa admits WP links to the genocide state of North Korea. "Mr De Rossa said they sought to establish relationships with a lot of other parties, including the North Korean Communist Party." March 5, 1997: De Rossa admits links to the Soviet Union: "He agreed the WP decided to seek formal relations with the Communist Party of the Soviet Union in November 1983. ... He understood from reports that contact had also been made in the 1970s." De Rossa admits other links to tyrants: "Mr De Rossa said the WP subsequently sought to establish formal relationships with the communist party of East Germany." March 6, 1997: De Rossa says Sean Garland of the WP did seek funds from Moscow. "Mr Garland said it was true he had sought money but he had not received any. He was asked what authorisation he had for seeking such money and he had said none, that he had done it of his own accord." De Rossa did not see this as morally wrong: "Mr De Rossa replied that it was not a serious matter to seek funds from other parties. The money was not sought from Russia. As he understood it, it was sought from the Communist Party of the Soviet Union. It was not a crime to seek financial support from other parties." De Rossa admits the WP received support from East Germany: "Mr MacEntee asked if the WP had any support from East Germany. Mr De Rossa said there was an occasion in 1987-'88. There was a request to a party in Germany to know if they would be in a position to provide them with a printing machine." Proinsias De Rossa's support for communist Nicaragua. He praises the Eastern Bloc for finally (after 40 years) letting its slaves go, and says the Eastern Bloc countries have therefore "proved more responsive to popular pressure" than the western countries which have allowed their people actually pick the government for all of those 40 years! Finian puts his faith in Fidel's 'different' take on democracy, Sunday Business Post, April 30, 2006. Finian McGrath denies that Cuba is a repressive dictatorship. "It's a different kind of democracy to Ireland", said Ireland's useful idiot. McGrath called for a state visit to Ireland by the unelected dictator and mass murderer Fidel Castro. Finian McGrath, interviewed in Magill, Feb 2006: "I think Castro is a great guy, a charismatic figure who's been totally misrepresented by the West." Magill asks: "So you've no problem with his torture chambers and suppression of free speech?" McGrath: "Well, that's all news to me. I never heard about that. Amnesty hasn't said anything about it to me lately. This is just rightwing propaganda." Amnesty country report 2005. "[Amnesty International] last visited Cuba in 1988 and has not been permitted into the country since then." Says it all, really. A regime so criminal they will not even permit Amnesty to exist there. For example, Cuba: No dissent allowed, 9 August 2005: "The Cuban authorities continue to suppress any form of dissent by methods such as harassment, threats, intimidation, detention and long-term imprisonment." What is wrong with McGrath that he cannot simply read what Amnesty say about Cuba? Finian McGrath praises Castro at his death, Nov 2016. He says the decades of reports of human rights abuses are "exaggerated". Loves Cuban dictatorship. Hates Israeli democracy. Finian McGrath calls for economic sanctions against Israel, report, 1 Jan 2018. 2015 article: 12 Israeli Technologies Changing the Lives of the Disabled. 2018: Irish Minister for Disability Issues calls for boycott of Israel. Terrorists slash their way into the heart of the American Dream, Fintan O'Toole, September 12, 2001. He couldn't even stop spewing anti-Americanism for one day! He reacted to the deliberate killing of thousands of innocent American men, women and children by hate-filled Islamic religious fascists as follows: "But there will almost certainly be a dark side. For there is in American culture a fundamentalism no less strong than that of those who may have plotted yesterday's carnage. The tendency to divide the world between the forces of God and the forces of Satan, the elect and the damned, is, ironically one of the things that America shares with its most ferocious enemies." Reaction by Eoghan Harris, 16 Sept 2001. Fintan's selective facts by Eoghan Harris, October 6, 2002. To me, Michael D. Higgins is the political heir of Eamon de Valera, and Fintan O'Toole is the intellectual heir of Alfred O'Rahilly - providing the intellectual support for an inward-looking, "anti-imperialist", anti-foreign companies, anti-capitalist, neutral Ireland that refuses to support Britain and America in this great war on fascism. Eamonn McCann is not all bad. He has been a pioneer in atheist secularism both North and South of the border. He has been fairly anti-sectarian on the NI issue. But he is also a radical leftist who is anti-American, anti-Israel and, like so many left-wing "atheists", pro-Islam. He is a Trotskyist and a member of the pro-jihad SWP. He openly supports the Islamic religious jihad groups Hamas and Hezbollah. His solidarity with right-wing Islam abroad seems rather a betrayal of his left-wing secular ideas at home, to say the least. McCann claimed (Eamon Dunphy show, Newstalk 106, Mon 20 Mar 2006) that the Iranian President Mahmoud Ahmadinejad was "elected". Nice to know he supports brave dissidents struggling for freedom in foreign lands. McCann, 6 Feb 2014, spins for the Iranian regime's bid to get nuclear weapons. He refers to "Iran's ambition to develop its nuclear programme for - it insists, entirely plausibly - peaceful purposes". McCann seems to be a "secularist" only when it comes to Christianity. When it comes to a religion he admires, Islam, he is horrified by disrespectful people who criticise it. McCann's statement on the Danish cartoons, March 2006 (and copy): "the recent decision of [the editors of "The Blanket"] to re-publish deliberately provocative, racist anti-Muslim cartoons, commissioned originally by the right-wing Danish newspaper, Jyllands-Posten, is a step too far. In our view, their publication marks the end of any positive role that The Blanket might play in a world saturated in anti-Muslim prejudice". 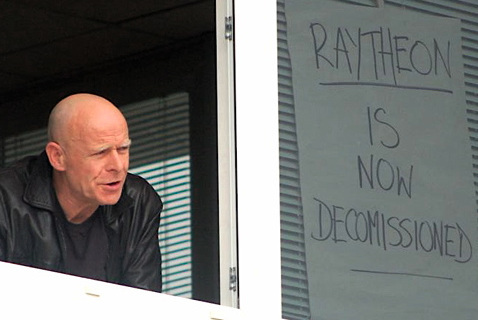 Eamonn McCann led a sabotage attack on allied equipment in wartime, destroying the offices of US defence company Raytheon, Derry, Aug 2006. He openly admits it: "we hurled computers from the windows, used fire extinguishers to put the mainframe out of action and destroyed any paperwork and computer discs we could find". Why do we don rose-tinted spectacles for Obama's war?, Eamonn McCann, 11 May 2011. President Obama in reality is carrying on the war against the jihad in a very similar manner to President Bush, despite Obama's dreadful appeasing rhetoric. But the Irish left, which hated Bush, are silent, because Obama is a Democrat, and black. McCann is rare on the Irish left in pointing this out, and continuing to oppose Obama. One could almost admire his integrity - if integrity in a jihad supporter was something to be admired. McCann says: "What did George W. Bush do which Obama is not continuing to do? The main differences seem to lie in skin-tone and hypocrisy quotient, with George W. coming out lighter on both counts." I agree with McCann. The only difference is he thinks this is terrible, whereas I think it is great. During the "Innocence of Muslims" riots of 2012, when right-wing religious maniacs rioted and killed across the world, secularist Eamonn McCann came out with a strong defence of free speech and the right to criticise religion. Only kidding! This is Islam, a religion he admires because it is violent and anti-western. (At least, a large part of it is.) So he rushes to the defence of religion. The right side of history and freedom of speech, Eamonn McCann, 27 Sept 2012. "the publication of cartoons or films mocking Mohammed can seem to sum up an all-encompassing racist hatred and contempt for Muslims. ... the key element of freedom of expression is the right to decide whether and what to express and when. Considering publication of the material many Muslims find offensive against the background of the West's role in the Arab and Muslim world, the principled, moral course is freely to decide not to publish." Eamonn McCann, 24 Mar 2016, defends Cuba's communist revolution and dictatorship as "the overthrow of the alliance of the Batista regime and US freebooter capitalism". He says about the US conflict with Cuba: "there�s a balance of political morality to be made ... and the weight of morality is on Cuba�s side." Yes, Cubans have no human rights, and there have been no elections since 1950, and the Cuban economy was destroyed, and the people impoverished for decades, but at least "freebooter capitalism" suffered a setback. Hurray! It is the everyday harassment that shows the hatred behind official Israeli ideology, Eamonn McCann, 3 Oct 2013, contains insane hostility and prejudice against Israel. "A friend of a friend" of McCann saw Israeli people behaving badly, maybe decades ago! In his first story, his former partner once allegedly saw (in the 1960s?) "Arabs shrinking back on the pavements to allow Jews to pass, being literally, physically pushed out of their way if they didn't move fast enough". In his next tall story, a communist nutjob friend once allegedly saw (in the 1930s?) "a group of Jewish settlers moving through a market in Haifa systematically pouring kerosene over the produce on display on Arab fruit and vegetable stalls." Elder of Ziyon replies: "I have visited Israel frequently and have not seen any such incidents. Arab schoolgirls walk fearlessly in Jerusalem, giggling amongst themselves like any other kids. Jews and Arabs shop together in the malls, Arab and Jews work together in the hotels and hospitals." I agree. When I visited Israel in 2014, it was notable that there were Arabs everywhere, freely working, shopping and mingling with the Jews. Everyone seemed pretty tolerant. McCann is a hate-filled ideologue, not a truth-teller. Shame on the Irish Times for printing such rubbish. See also replies by Honest Reporting and Daphne Anson and CiF Watch. Eamonn McCann writes something even more ludicrous: Sharon and Paisley shared a belief that their people were chosen by God, Irish Times, 16 Jan 2014. He claims that the late Ariel Sharon was motivated by primitive religious fundamentalism. He compares Sharon to Ian Paisley. "Each based his ideology on books of the Bible". He quotes from appalling books like Genesis and Leviticus. But there is just one problem: Ariel Sharon was secular (maybe even atheist) and never talked about religion. And then you notice that McCann never actually quotes Sharon. It is telling that McCann never produces any quote from Sharon to show he was motivated by religion. He simply declares that "Sharon will have believed as he went about his work that he was wielding the sword of God" without bothering to provide a word of evidence that Sharon believed this. Shame, shame on the Irish Times for printing this rubbish. A reader's letter replies on 20 Jan 2014: "Sir, - Eamonn McCann's article ... lacked one important thing - namely, facts, to support his thesis. At no point does McCann provide any evidence that the biblical quotes he provides, or any part of the Bible, had any impact on Ariel Sharon's political ideology." Irish Times fanatic Eamonn McCann spreading fake quotes about Israel, analysis, Feb 2016. Socialist Worker no.262, 8 Aug 2006. 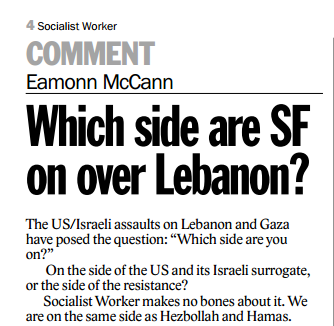 Eamonn McCann declares open support for the Islamic religious jihad: "The US/Israeli assaults on Lebanon and Gaza have posed the question: "Which side are you on?" On the side of the US and its Israeli surrogate, or the side of the resistance? Socialist Worker makes no bones about it. We are on the same side as Hezbollah and Hamas." Eamonn McCann photographed with a mob looting the offices of US defence company Raytheon, Derry, Aug 2006, because it supported Israel. The Israel-hating fanatic Eamonn McCann, 14 July 2014, calls irish4israel "racist buffoons". And the Irish Times prints this guy. 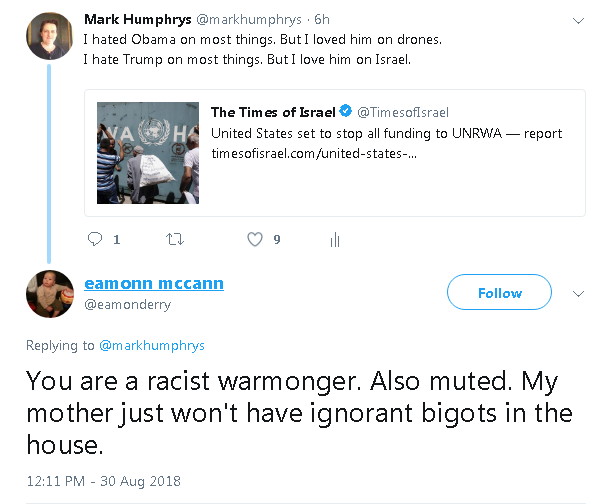 The anti-Israel fanatic Eamonn McCann, 30 Aug 2018, calls me "a racist warmonger". Shame on the Irish Times for giving this libellous extremist a platform. Saddam trial breaches international law, Vincent Browne, October 23, 2005. Vincent Browne disputes the trial of Saddam: "Saddam Hussein was quite right to question the presiding judge at his trial. Under what authority was Rizgar Mohammed Amin sitting in judgment on the legal president of Iraq? Saddam was a tyrant, he manipulated the electoral process to give feigned legitimacy to his rule but, under international law, he was - and remains - president of Iraq. In contrast, the judge presiding over the trial of Saddam has no legitimacy whatsoever. He was appointed by the illegal invaders and occupiers of Iraq. The court has no basis in the Iraqi constitution or Iraqi law. It has no basis under international law." This passage alone is enough to make me dismiss Vincent Browne's entire life's work. Nobody who describes an unelected dictator as being (or ever having been) the legitimate ruler of any country can be taken seriously when they write about politics. As Richard Waghorne says, such a statement is in opposition to "the fundamentals of democratic thought". Perhaps Vincent Browne is saying that the legal recognition of Saddam by other states shows what a nonsense international law is. But no, he intends the possible lack of legal status of the invasion to be a criticism of the invasion. Waghorne describes my world view: "Moral clarity demands that we deny tyrants the status of legitimate rulers. To do any less is to accord to unelected strongmen the same moral status as democratically elected leaders." Nuclear hypocrisy over Iran, Vincent Browne, Irish Times, February 1, 2006. Vincent Browne is relaxed about Iran's pursuit of nuclear technology. Why? Because the democracies have nuclear technology, so it would be only fair for every maniac dictator in the world to have it too. "Iran is entitled to develop nuclear energy". He even defends their threats against Israel: "In challenging the legitimacy of the state of Israel, Iran ... is advancing a reasoned opinion supported by historical fact." He even makes excuses for their pursuit of nuclear weapons: "If Iran wants to acquire nuclear weapons capacity, it has been encouraged to acquire it by those very countries that now threaten it." And of course he says Israel is to blame for Iran's plans to destroy it: "even if it was the case that Iran was then or is now trying to acquire nuclear weapons capacity, the blame for that would lie with those states that conspired to create those circumstances in which Iran feels it necessary to acquire such capacity." One would have thought the left would be against nuclear proliferation, not in favour of it. He actually condemns the 1981 Israeli bombing which stopped Saddam's nuclear weapons program! "How is it that double standards in the conduct of foreign affairs is the accepted norm?" he asks like a simpleton, wondering why it's ok for Israel to have nuclear weapons but not Iran. Why doesn't he try listening, just once, to the answer. It's because Israel is a democracy and Iran is a dictatorship. Dictatorships should not be treated the same as democracies, not on this issue, or any other. There's something fundamentally wrong with Vincent Browne that he cannot see this. He even ends with: "Meanwhile, hands off Iran." Thank heavens people like Vincent Browne don't run the US or UK. What a dangerous world it would be if people like him had power. Berlin Wall celebrations mask reason it was built, Vincent Browne, 11 Nov 2009, shows almost complete moral confusion. According to his leftie history, somehow the West provoked Stalin into oppressing Eastern Europe, something he would never have done otherwise. He concedes that "The repressive character of the East German regime" caused people to flee, but you have to love the passive tense: "in response to this leakage, .. the infamous Berlin Wall was constructed in August 1961." Not "the communist dictatorship constructed the Berlin Wall". But "it was constructed" by persons unknown. And you can feel the sneer around "the infamous" as if we are all very simple-minded for viewing it as evil. He then sneers that the evil America may have approved its construction. (According to him.) And further sneers that "its fall 20 years ago was seen as an emblem of victory for the "free world"". Yes, real sneer quotes this time. He sneers at the East Germans being granted the vote: "the rapture for western "democracy" has faded". Yes, his sneer quotes, not mine. Based on, well, no convincing evidence, he says of the wall: "its fall was not the liberation it promised." Crumbs, what a sneering cynic. Give me Ronald Reagan over Vincent Browne any day! Vincent Browne talks sense on crime! 13 Nov 2013. He says about the TV drama "Love/Hate": "The series underscored the sense that criminality, in the main, is associated with an assortment of "scumbags" ... "scumbags" emerging from communities that have no care for the welfare of children, for education, for the rudiments of decent living, for normal civilised behaviour. At times, it is conceded, these "scumbags" may be charming, even charismatic, but they embody a violent gene, bringing fear not just to their victims but also to society in general and in particular to the societies in which they operate. It is implied that they deserve to spend their lives behind bars, irrespective of the niceties of the legal system." Sounds about right. But then he spoils it all by saying this is not true! And instead he comes out with some Marxist sociology nonsense about crime being the fault of society, of inequality, of poverty, and so on. How pathetic. He needs to read some Theodore Dalrymple. Vincent Browne, Oct 2012, says Israel is a "cancer". He says that Israel, not Islamism, is the root cause of the global Islamist violence. He says: "Israel is the cancer in foreign affairs. It polarises the Islamic community of the world against the rest of the world. And unless you deal with the problem of Israel and the problem of Palestinians in that part of the world there is going to be conflict". This is what the left believes. This is why I am not a leftist. Tom McGurk, 6 June 2010, describes Israel's self-defence in the Gaza flotilla incident as: "murder, piracy, kidnap and gross larceny all in one. ... how does this action differ from what Somali pirates do on a regular basis off east Africa?" How Castro showed up Uncle Sam (scroll down for copy) by Tom McGurk, Sunday Business Post, 24 February 2008. A sick tribute to the dictator of Cuba. "Castro has left Cuba with real status among Latin American countries". Yes, indeed. The status of being the least free country in Latin America. Indeed, the only dictatorship in the region. "Following the fall of the Berlin Wall in 1989 and the dissolution of the Soviet Union in 1991, western capitalism and the free market seemed messianic and triumphant. Against this backdrop, Castro's solitary experiment, that persisted on a small island off the coast of Florida, became even more tantalising." So in the middle of all this wonderful good news, Cuba's sad, solitary, bad news story became "tantalising"? He obviously only has contempt for those Cubans who sadly hoped that the fall of the Soviet empire would mean their liberation too. The propagandist McGurk says: "Despite what propagandists say, the Castro revolution proved hugely popular with ordinary Cubans." How does McGurk know, since Cubans are not free to tell us? "Of course, the average Cuban has little material wealth, and the Party remains at the centre of everything. But, then, this is a society where, with food, housing and transport so cheap, and education and health free, material wealth is largely irrelevant. Anyway, since the state owns all the shops, goods are the same price everywhere. To be in Cuba is to experience the wonder of a society where the tyranny of consumerism does not exist. There is no advertising at all and individualism comes second to the common good." So, from his position as a wealthy, well-paid media star in Ireland, one of the richest and freest countries on earth, does McGurk casually dismiss a society of endless poverty and complete lack of individual freedom. Oh, the tyranny of being rich! If only McGurk could be poor like the Cubans! Of course, he doesn't actually want to live in poverty in Cuba, you understand. He just thinks it's wonderful that all those rustic, quaint, photogenic foreign people do. McGurk is in a long line of western leftists praising foreign tyrannies they would never live in. 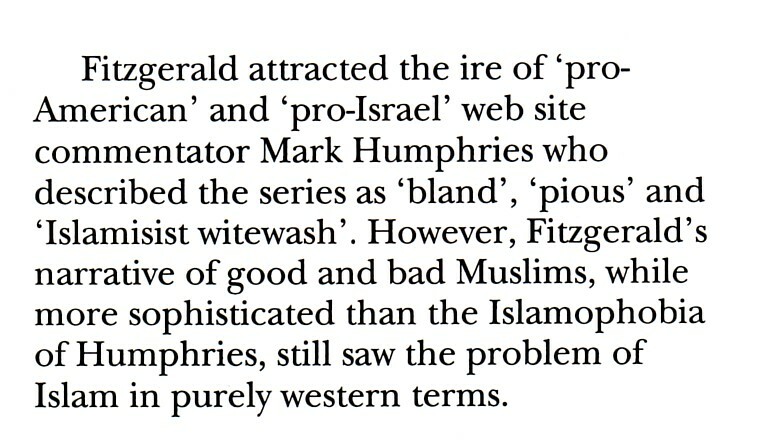 Mary Fitzgerald was introduced to us with a series of Islamist whitewash pieces in the Irish Times in 2006. For some reason, the Irish Times decided to print a long series of bland, pious whitewashes by Fitzgerald of Islam, Islamic history, Islamic teaching, Islamic clerics and Islamic organisations. Just as they do not understand the neo-cons, so the Irish Times reader does not understand the jihad. And this bland, politically-correct spin will keep them that way. Tony Allwright on a classic example of media bias in a Mary Fitzgerald article on Al Jazeera: "she contrasts it with the "rabidly right-wing" Fox News and the "sombre, earnest and careful" BBC. Why does she omit the epithet "left-wing" from the BBC's description, being its most abiding characteristic?" All that glitters is not literary gold, Mary Fitzgerald, October 11, 2008. Islamic religious maniacs try to kill the publisher of a book about Mohammed in London in 2008. And how does Fitzgerald respond? By sneering at the book, not at the Islamic maniac bombers! If people were bombing the Irish Times because of Fitzgerald's writings, I would not concentrate on how crap her articles are. I would be outraged at the threat to western free speech. The future of Islamic Ireland (also here), Mary Fitzgerald, Irish Times, 12 Feb 2011, is the usual whitewash. Muslim immigration is simply seen as a good thing. While I have sympathy for any individual Muslim trying to improve their life, the concept that more Muslim immigration might eventually lead to violence, or calls for sharia - as has happened in the UK and other places - is simply not mentioned here. There are no sceptical voices. She notes that the Clonskeagh mosque is linked to the Muslim Brotherhood and Yusuf al-Qaradawi. But what they stand for is not really explained. She notes that al-Qaradawi supports Palestinian suicide bombing. But she does not explain his other abhorrent beliefs. Nor are the beliefs of the Muslim Brotherhood explained. We get a vague statement that MPAC promoted an "austere Salafist strain of Islam" without any explicit mention of the fact that they openly threatened the freedom of all Irish people. Ireland's first major Islamic terror plot is not mentioned. Maybe it's just "what we should expect" from new immigrants. The article quotes "typical Muslim" Eoin Whelan. Is this the Eoin Whelan who was linked to MPAC? In typical statist and grievance-mongering style, the article ends by demanding that the government must change, not new Muslim immigrants. Young, Arab and angry, Mary Fitzgerald, Irish Times, March 5, 2011. Fitzgerald casually quotes Abd al-Bari Atwan supporting the Arab revolutions, without telling us that he is a supporter of Islamic fundamentalism and Islamic terror. He supports nuking the Jews of Israel: "If the Iranian missiles strike Israel, by Allah, I will go to Trafalgar Square and dance with delight." Does Fitzgerald, with all her meticulous research, not know about this guy? Or does she not care? Tremors of attacks still reverberate for Muslims (also here), Mary Fitzgerald, Irish Times, 7 Sept 2011. She sympathetically quotes the son of Bin Laden mentor Abdullah Azzam (died 1989) as claiming that his father would not have supported 9/11 and Al Qaeda. No evidence for these absurd claims is presented. Abdullah Azzam supported global terror against the infidel. He promoted the blood libel against the Jews. He said the Jews "mix the blood of a Christian or Muslim into dough." There is even a terrorist group called the Abdullah Azzam Brigade. Fitzgerald claims that "The soul-searching the attacks triggered in the US was mirrored in many Muslim-majority countries". Yet no evidence of this "soul-searching" is presented. Indeed it is notable how little soul-searching about jihad, sharia, the Koran and Mohammed took place in the Islamic world after 9/11. Even later in the same article she notes that the majority in Jordan, Indonesia and the Palestinian territories supported Bin Laden in 2003, 2 years after 9/11. She notes that Al Qaeda support has declined since then, but this is not "soul-searching" after 9/11. It is Muslims who support or tolerate the killing of Jews and infidels suddenly being angry when Muslims get killed. It is self-interest and gross hypocrisy, not "soul-searching". Fitzgerald claims that "The once-plodding process of reforming an ancient religion to fit contemporary times has accelerated in the decade since 9/11". But again no evidence is presented. In reality, there has been little reform in Islam since 9/11. Those Muslims willing to re-examine the Koran and Mohammed are still a tiny minority under death threat. She praises Saudi fanatic Salman al-Ouda for his alleged "moderation", without noting his strong support for jihad terror and support for killing Americans in Iraq. She spins women wearing the hijab as good, she promotes Turkey's Israel-hating Islamists as a model - the left-wing spin goes on and on. The Abdullah Azzam Brigade is even linked to Al Qaeda! They said in May 2011 after the death of Bin Laden: "May Allah have mercy on Osama, the Sheikh of Jihad, the Imam of Piety, the example of asceticism and the model of patience, the pioneer of glory in this age, and the awakener of the Ummah from its slumber. We in the Brigades of Abdullah Azzam bear witness that we only went out for jihad after incitation from Sheikh Osama bin Laden, by his words and his actions." Maybe Mary Fitzgerald should explain to them that Abdullah Azzam would have opposed all this. I'm sure they'd like to know. 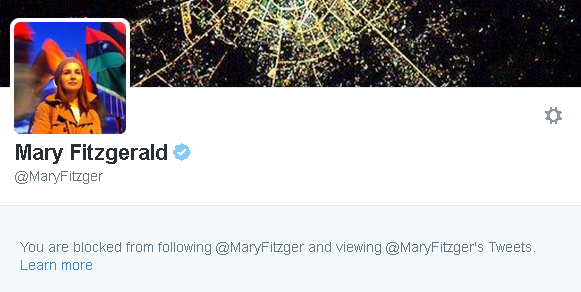 Here's a good example of why in 2006 I said Mary Fitzgerald does a line in whitewash rather than exposure. See the article: "Muslims divided on cleric's teachings", Mary Fitzgerald, Irish Times, October 6, 2006. This is an article about one of the world's leading Islamofascists, Yusuf Al-Qaradawi. She puts in some (but hardly a lot) of the bad stuff about this repellent nazi, but she never puts the boot in. Instead she sneers at a British "tabloid" for calling him "evil". She ends with: "Extremist or moderate? The jury is still out." From that article, would you ever get the impression that Yusuf Al-Qaradawi was the raving maniac praising Hitler above? Azzam Tamimi in 2006 calls for the elimination of Israel: "anybody in the world, with faith or without faith, must come together in order to eradicate this cancer from the body of humanity." In the article on Al-Qaradawi above, Mary Fitzgerald quotes Azzam Tamimi as if he is some reasonable commentator. A 22 year old Irish Muslim is killed fighting in Syria in Dec 2012. What is the one question most people would ask? That's right: What was he fighting for? Does Mary Fitzgerald address that question in the article? No. The article has an almost comically misleading headline: "Drogheda man"! How pee-cee can you get. The Irish Muslim killed was in fact fighting for the jihadist group Liwaa al-Umma, which wants to enslave Syria under sharia law. He was certainly not fighting for Syrian freedom. Mary Fitzgerald in fact explains Liwaa al-Umma elsewhere. But not here. 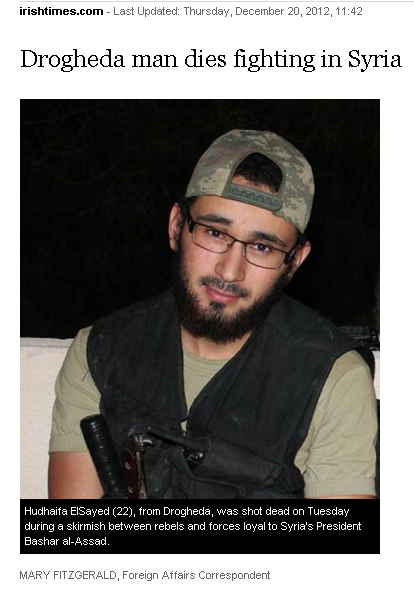 El Sayed said his motives for fighting were as follows: "searching for the truth, defending the weak against injustice and the oppressors, and helping to build peace in the world". A comment suggests this is just code for fighting for Islam: "Every 'reason' that El Sayed gave for joining the jihad to overthrow the Alawites, is also the 'reason' that will, sooner or later, animate those who will plan and plot and actively embark upon Muslim jihad within Ireland itself, against Irish non-Muslims and the non-Muslim polity of Ireland." Fr. Joe Jones, Catholic chaplain at Dublin City University, praises the Islamic jihadist, 14 Feb 2013. Em, are you sure you know what he was fighting for? How Mary Fitzgerald responded to this page. Pretty unimpressive. Why not try debating me? Phoenix magazine mentions me in an article about Mary Fitzgerald in Sept 2010, and lies about me. The left-wing Phoenix magazine, 24 Sept 2010, mentions me in a profile of Mary Fitzgerald. First, they spell my name wrong. Is this deliberate, so readers can't Google my site and see for themselves? They just made it up. It is a lie. My section on Mary Fitzgerald on my site in 2009. I never misspelled "Islamist" or "whitewash". Phoenix lies about me in 2010.